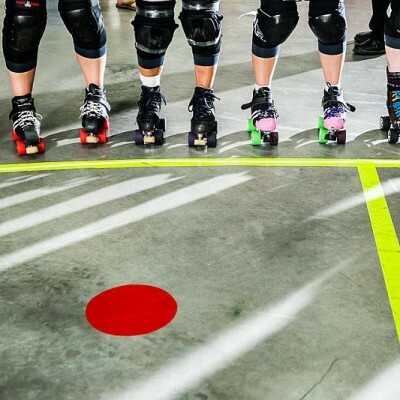 Ever wondered how to incorporate weight training into your derby crosstraining routine? Felt intimidated by the machines, the muscleheads, or the unlimited choice of possible exercises? She can’t fix the testosterone level at your gym, but Lilith NoFair (aka certified Personal Trainer Laura Wombwell) is back for Part II of her “Big Rocks” training series to break down exactly how to prioritize and maximize your time at the gym. 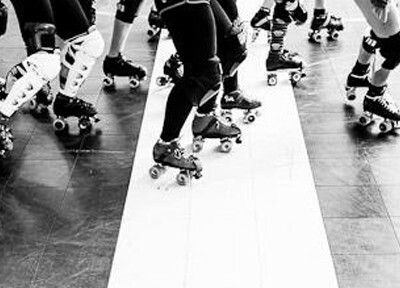 NoFair is head honcho of How We Roll Fitness, one of my very favourite derby and fitness blogs. In case you missed it, do check out part 1 of this piece first. Next, hit your big rocks. Choose 3-5 exercises per session. Work your full body. Focus on form – quality over quantity (this is where a training partner can make a world of difference). Don’t train more than 45-60 minutes. Choose exercises that are appropriate to your level of fitness. If you have terrible shoulder mobility, you probably shouldn’t be pressing anything over your head just yet. If you are getting over an ankle break, maybe nail down your bodyweight squat range of motion before you grab that barbell. I like circuits – a consecutive series of exercises using the same resistance – because they challenge my endurance, my strength, and my mental fortitude. Also, they make me feel SUPER EFFICIENT. Two back exercises to one front, which is great for those of us who ride a desk all day. Combining the hinge and single leg work for maximum awesomeness, then combining core and row for a pretty challenging finish. To change things up, you can break a circuit up into smaller supersets of 2-3 exercises – for the above, you’d do all of your sets of rows and squats, then move to the last 3 exercises. Muscular Endurance – 1-3 sets, 12-20 reps. You can’t lift particularly heavy weights for that many reps, so find a lighter load. Remember, endurance is the goal, so 30 to 60 seconds between sets, but no more. Muscle Size (Hypertrophy) – 3-5 sets, 6-12 reps. Higher weights, about a minute rest in between sets. Strength and Power – 3-6+ sets, less than 6 reps, LONG rest between sets. Form has to be perfect with each rep, since the weight you’re lifting will be significant. The heavier the weight you use, the less reps you should do. The less reps you do, the more sets you should perform. That way, the total number of repetitions performed stays pretty consistent. It’s also good to keep your sets and reps “wavy”. Change up your set/rep/weight structure every now and then to keep your muscles adapting. How much weight should you use? Well, at first, your body weight. Then, If you can nail all your prescribed reps with perfect form and without difficulty, bump your weight up in 5-10 pound increments. I like the last 2 reps of any set to be a challenge. • If you have time for one thing – strength train. For most people most, 3x a week is a decent amount. • If you have time for two things – strength train and do high-intensity anaerobic interval training (HIIT). ** Try for twice a week. This is where you get your plyo, your agility, and your speed work in. I like to interval train for about 15 minutes, after I’ve finished lifting heavy things. • Only if you have time for all three should you add in steady state cardio. Yes, cardiovascular endurance is important, but hours on the treadmill might not be the best use of your off-skates time. Here’s why – If you train your aerobic system exclusively, you’ll have great endurance, but might not have the gas you need to catch a jammer flying out of the pack. If you train your anaerobic system (working hard enough to be breathless), you’ll increase your lactate threshold, which in turn will improve aerobic performance. Lactate threshold is the point during exercise at which your blood lactate builds faster than it can clear, and your muscles fatigue (for more info, read this). If you work on pushing the line where this fatigue happens (through HIIT), you’ll have better long-term endurance, as well as those explosive blasts of energy. If you’re brand new to fitness, start with steady state and work interval training in gradually. 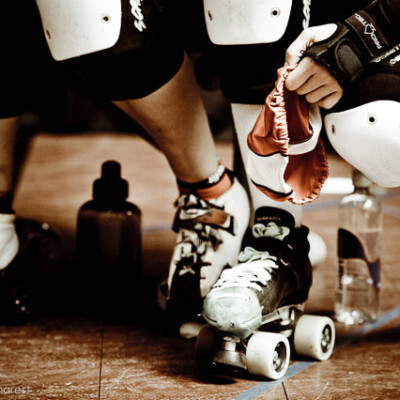 As with resistance training (and derby training, and life), dominate the basics, then add in greater challenges. Be safe, be smart, and be honest about where you’re starting from. Finish off with a cool-down, some stretching, and a shower. Whether it’s resistance training, cardio, nutrition, or on-skates training, don’t be afraid to ask for help. Another set of eyes can be invaluable – they’ll help to make sure you’re nailing your form and give you real-time feedback about your progress. Finally, it’s also important to take your rest days. Gains come during recovery – if you train and train and train and never give your body time to rest and recover, you won’t see the same gains you would if your body had proper recovery time. Take care of your soft tissue. Foam roll, get massages, stretch copiously. Take one day a week that is off-program. You don’t have to sit around doing nothing all day, your activity that day should be anything you want it to be – a walk in the park, playing with your kids, a leisurely skate, whatever makes you excited about movement. Just like there isn’t one perfect stride, there isn’t one perfect way to cross-train. Everyone has their own goals, their own limitations, and their own strengths. The most important thing is to find a program that you can commit to, one that progressively challenges you, and one that you can make a dedicated part of your schedule. I promise, once you get started, it’ll get easier and easier to find the time. Just keep it simple, rock your big rocks, and get ready to be even more awesome. * Looking for another easy warm-up option?